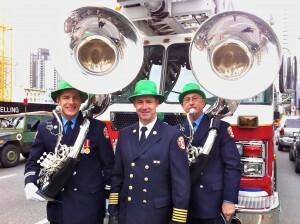 Wow, did we ever get lucky with great weather for the St. Patrick’s Day Parade this year! It was almost — almost — sunny at moments, but even better, it was neither raining nor all that chilly. We even got to break in not one but *TWO* brand shiny new tubas that arrived just in time for this grand occasion! Here are some clips from YouTube posters that we hope you enjoy. I hope you all realize just how much we appreciate you all taking and sharing videos of these occasions. Not only is it fun (and instructive!) to see and hear ourselves as you see and hear us, but it also gives us a chance to enjoy the rest of the parade performances and exhibits, like the wonderful little Irish dancers (their banner reads “Eire Born”) at about 6:00 into the video by off2theairport, or the Irish line dancers on the float at about 8:30. Actually, there are so many great costumes, dances, music, vintage vehicles, it’s hard to pick favourites!